The BOMA Membership Committee will be hosting a complimentary breakfast mixer. The event will be held on Wednesday, February 27, 2019 at Great Maple at UTC Westfield starting at 8:00am. 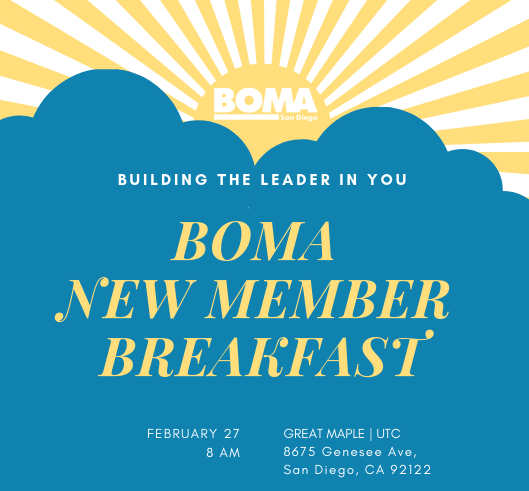 New members are invited to join the BOMA San Diego Board of Directors, Chairs and Committee Chairs for a breakfast meeting to learn how to make the most of your membership. Register now for this informative and fun event! Raffle Giveaway Courtesy of RSI Roofing & Solar!